Luxury resorts, a cultural park, and high quality trains between Hanoi and Lao Cai will be added from the first quarter of 2017. High-quality railways transportation to the northwest will soon be available in order to increase tourism to the region, according to the Hanoi Railway Transport Joint Stock Company (Haraco). The train route to Lao Cai is the jumping off point for Sapa, one of the nation's most popular destinations for travelers. The time it takes to travel there will be shortened to six hours from nine for day trips and seven hours for overnight rides. In addition to faster speeds, the interiors of some of the trains are to be upgraded into double rooms with bathrooms, kitchens, fridges and even karaoke systems. Massage services and dining services will also be offered. Many chefs of popular restaurants in Hanoi have already been invited to participate and plan to offer impressive menus to tourists. The dishes will consist of specialties from various areas of Hanoi, Lao Cai and other northern places. A discount program of 7-20 per cent will also be offered to individuals or organizations that buy more than 20 tickets and to travel agents that participate in Haraco’s tourism promotion program. The company offers the transport service from Lao Cai station to various hotels in Sapa and vice versa for a package price of VND35,000 ($1.5) per person for the 40 kilometer trip. Lao Cai is the home of popular destinations such as Sapa and Bac Ha which provide stunning vistas of beautiful terraced rice fields, immense forests and majestic mountain ranges. Sapa has been recently listed as one of the 50 most beautiful places in Asia, according to Condé Nast Traveler, a global luxury travel magazine. It was also cited by tourism website Lifehack as two of the seven reasons why tourists should go on holiday in Vietnam. 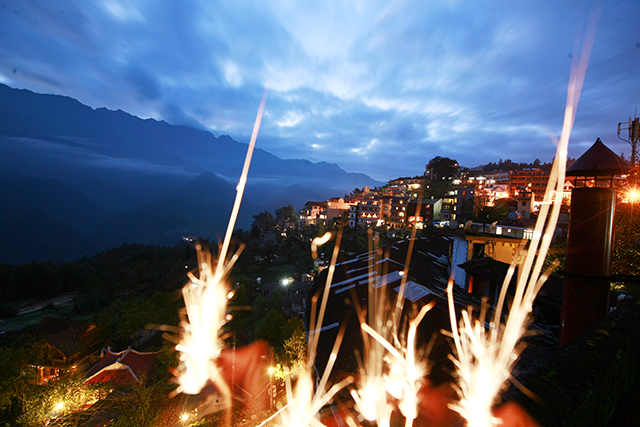 Lao Cai province is also making an effort to develop tourism in Sapa and the province as a whole. The province is planning to build the Sapa cultural park on 118 hectares of land in the style of Disneyland but with ecotourism and luxurious international-standard resorts. From 2016 to 2020 Lao Cai will be building several large projects including three, four and five-star hotels totaling 6,000 rooms as well as shopping and conference centers. All in all these projects will cost around VND10 trillion ($448.3 million). Sapa is expected to welcome 2 million tourists by 2020 and 5.2 million by 2030 according to the general master plan for development for the Sapa National Tourism Area. The Ministry of Transport has also decided to build Lao Cai Airport at the end of this year which is expected to be completed by late 2018. Since early 2016, nearly 500,000 visitors have travelled to Lao Cai by train of which 200,000 were international tourists.